Way back in September 2013, director Ron Howard said his highly-anticipated adaptation of Stephen King's The Dark Tower "is not dead yet," but we haven't heard much about the project in the year and a half that followed. Today, Deadline is reporting that Sony Pictures has teamed up with Media Rights Capital (MRC) to co-finance The Dark Tower, with MRC also developing a "complimentary TV series." When the project was first moving forward at Universal, there were plans for a movie trilogy and a Dark Tower TV series that will air between each movie. Stephen King's novel series centers on a lone gunman named Roland Deschain, who sets off on a journey to find The Dark Tower, which is rumored to be a magical portal to other worlds. The author wrote seven books in the series, along with the short story The Little Sisters of Eluria. This new adaptation is based on Stephen King's first book in the series, entitled The Gunslinger, which focuses on Roland's relationship with a young boy named Jake, who is from a different time and place. Akiva Goldsman and Jeff Pinkner wrote the most recent draft of the screenplay, which the writers completely re-conceived from the version that was previously in development at Universal Pictures and, for a brief period of time, Warner Bros. However, while Ron Howard was previously set to direct, it seems that isn't the case anymore, with Deadline reporting that Sony and MRC will pursue a director with this new script, in hopes of putting this project on the fast track. 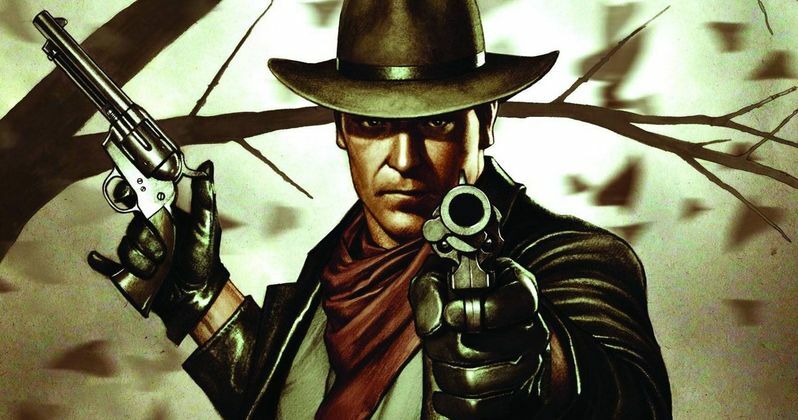 Over the years, actors such as Javier Bardem and Russell Crowe had been mentioned to take on the Roland Deschain role, but casting won't begin until the studio finds a director. Ron Howard is still attached as a producer with his Imagine Entertainment partners Brian Grazer and Erica Huggins, along with writer Akiva Goldsman. Stephen King is also set to produce, with Jeff Pinkner serving as an executive producer. Here's what Stephen King had to say in a statement. "I'm excited that The Dark Tower is finally going to appear on the screen. Those who have traveled with Roland and his friends in their search for The Dark Tower are going to have their long-held hopes fully realized. This is a brilliant and creative approach to my books." Sony Pictures Entertainment Motion Picture Group chairman Tom Rothman had this to say in his statement. "There are few projects out there that compare with the scope, vision, complex characters and fully drawn world that Stephen King has created with The Dark Tower. I am a giant fan. And, as Stephen himself does, we love the direction that Akiva and Jeff have taken. This is a great opportunity for a director to put his or her stamp on a cool global franchise." Are you excited that The Dark Tower is finally moving forward after all these years? Who do you think should play Roland Deschain? Chime in with your thoughts below, and stay tuned for more updates on The Dark Tower.